I love fresh basil. In an omelet, on grilled chicken, even in a tuna casserole. (You should try it.) And because I’m thrilled by small things, I’ve been totally enjoying going out to my flower garden (Yes, flower garden. I still, after 23 years of marriage, haven’t planted a food garden.) and picking fresh basil to use in a recipe. Yeah, it was amazing. I’ll try to do a recipe post for this one too. But today we’re here to talk about calzones (not to be confused with Stromboli). If you make some ahead and freeze them, these can make a nice easy lunch. First step is to get your dough going. Using the recipe for freezer-friendly pizza dough, follow all of the steps as if you are making pizza. Spray your counter top lightly with cooking spray and roll out each piece into a circle that’s about 6-7 inches across. The dough will be fairly thin. If your dough is still pretty thick once you have a 6-7 inch circle, you probably need to divide it again. Dollop as much ricotta cheese as you like evenly around one side of the dough. Next, add 2-3 thin slices of tomato, a handful of fresh spinach, and about 1/3 cup of shredded mozzarella cheese. Remember to keep it all to one side. And I can’t begin to explain why there are no pics of the fresh basil going into this piece of beauty, but this is where you’d do that. Just give it a rinse and tear it into small pieces and do some decorating! Now is the time to fold this baby in half. At this point you can either freeze them, or bake them on 425° for about 15 minutes. If freezing for later, line a cookie sheet with either waxed paper or parchment paper. Cover with plastic wrap and freeze until firm (doesn’t have to be frozen through). Transfer to a large freezer bag. Label with name, date, and cooking instructions. But what are the cooking instructions? You’re wondering. Allow to thaw on the counter for 4-6 hours. Bake on 425° for about 17 minutes. But not in a gloating sort of way, in a friendly “hey I have a recipe to share with you” sort of way. Lightly spray counter with cooking spray. Roll dough into a circle about 6-7 inches across. Dollop ricotta cheese on one half of dough. 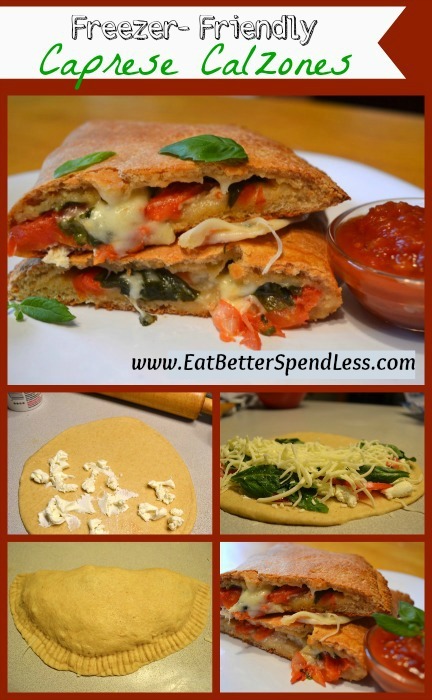 Layer torn spinach leaves over cheese. Layer sliced tomato over spinach. Sprinkle with torn pieces of basil. Seal dough all the way around by pressing with a fork. Freeze, or bake at 425° for about 15 minutes.